iCallU is a fix all solution for those wanting a quick way to call, text and email without having to switch apps all the time. It is well designed and works well. There are plenty of nice features here, but the one I liked in particular was the design of the keypad, which also has T9 functionality, but the good thing here is that there are a whole bunch of skins available for free download. ☆ Extremely fast start-up so no time is wasted – it only takes less than 3 seconds to load over 2,000 contacts, even on iPhone 3G! ☆ Familiar large keypad interface that is comfortable to the eye. ☆ Locate your contacts and call directly from one interface. Simply spell out your contact’s name on the dialing keypad and the T9 search function will sieve it out and display it for instant dialing. 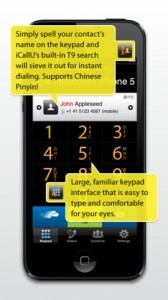 Supports Chinese Pinyin on T9 Contacts Search! ☆ Sort, store and search your contacts by their first or last names easily. ☆ Visually enhance your contacts by assigning photos to their profiles, allowing you to scroll and find them more quickly. ☆ Arrange and view each contact’s list of numbers in the order you prefer. 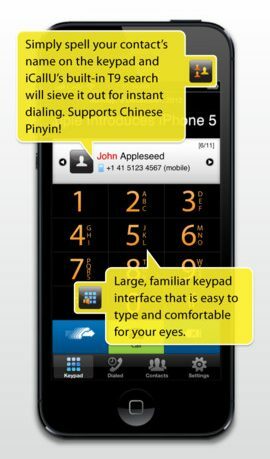 ☆ All-in-one display that allows you to send SMS / email / iMessage from one quick shortcut button. ☆ Easily edit phone numbers before dialing. 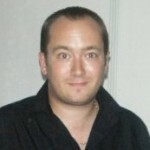 ☆ Create, edit and save a contact easily from iCallU after a number is dialed. ☆ iCallU remembers your last dialed number, even after reboot. ☆ Manage your call logs effectively on our user-friendly call log display, featuring the option to delete call entries individually. iCallU is very easy to use. There are four main sections along the bottom of the screen where you can select the keypad, phone, contacts and play around with the settings. That the developer has managed to fit so many options into such a streamlined interface is a credit to them. So, as you can see, there is plenty here to keep you occupied. The fact that this is all in one app when the developer could easily have split it into three app and charged separately is really nice, and I can see this becoming the ‘go to’ app for power users. The fact that they have added Skype and WhatsApp integration is a real sign of intent from the developer and shows that this is an app that is going to be constantly updated and improved. Overall, this really is a good app, and one you should snap right up.